As far as food legends go, this soup originated in Wales but versions of it are made all over the world. To achieve an ultra creamy texture without adding cream, simmer the vegetables until quite tender and blend until completely smooth. Place the butter, leeks, potatoes and bacon in a large saucepan and cook 5 to 8 minutes over moderate heat while stirring. Add 250 ml of the water and stock powder and simmer for 30 minutes or until completely tender. Blend with a stick blender or cool a while and pour into a food processor to blend until quite smooth. Return to the saucepan and add the remaining water and milk. Bring to boil, season to taste and serve piping hot, garnished as preferred. 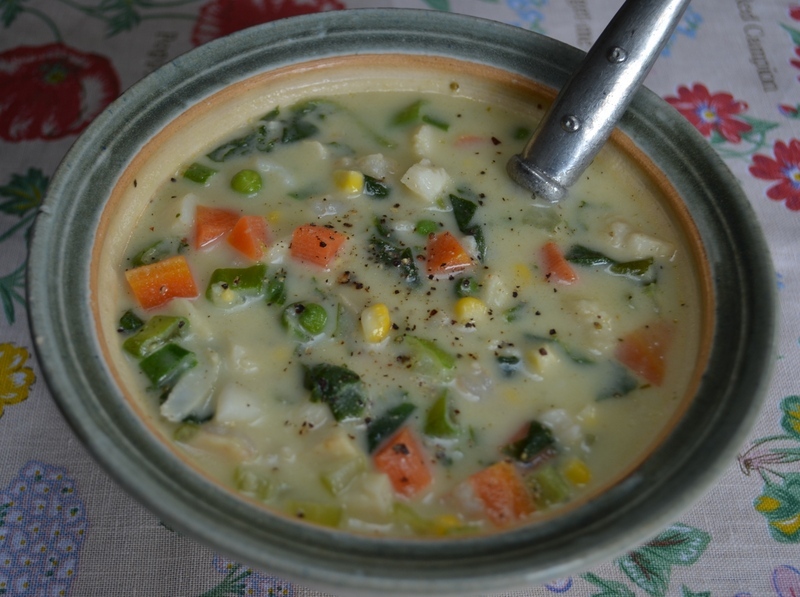 Use mainly the white and very pale green parts of the leeks for this soup. Recipe by Carolié de Koster from the Art Of Cooking Recipe book p. 95. 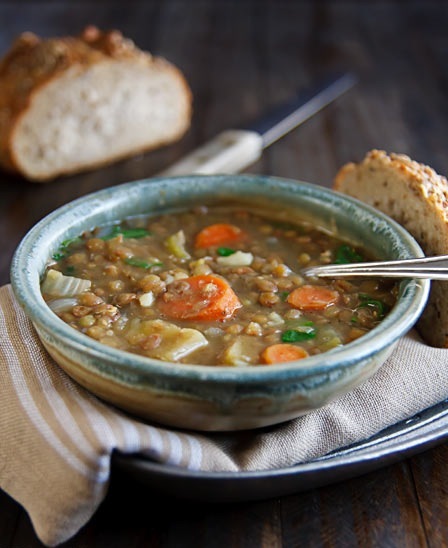 This soup is a not only low-kilojoule option for those watching their kilojoule intake, it is also vegetarian. It is quick and easy to prepare and can easily be “beefed” up with the addition of ham or cooked bacon. Place the broccoli and cauliflower in a large saucepan, cover with boiling water and bring to the boil. Simmer for 3 minutes and drain. This removes any strong undesirable flavours. Heat the butter in a saucepan and sauté the celery, leeks and garlic for 5 minutes. Add the broccoli, cauliflower, water and stock powder and bring to the boil. Reduce the heat and simmer gently for at least 3o minutes or until the vegetables are tender. Cool down a little, and liquidize until completely smooth. Return to the saucepan. Blend the flour with part of the milk, add the remaining milk and stir into the soup. Bring to the boil, stirring from time to time, and season to taste. Simmer for 5 minutes and serve piping hot, sprinkled with snipped spring onion. Carolié de Koster from the Art Of Cooking Recipe Book p. 96. 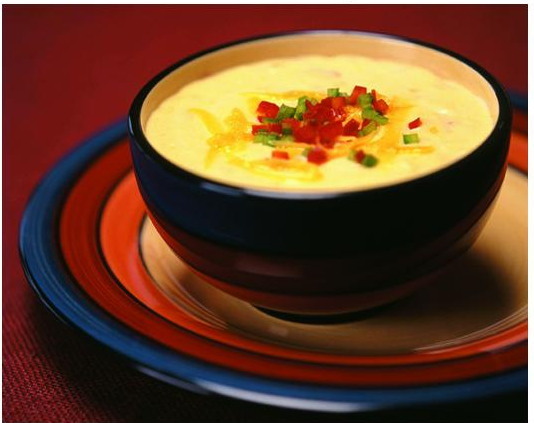 A creamy cheese soup, subtly flavoured with the typical Mexican ingredients such as tomato and green peppers. Place the butter or margarine, spring onion, garlic, green pepper and tomato into a large saucepan and saute gently for 8 – 10 minutes while stirring from time to time until all is tender. Stir in the flour, cumin and pepper. Add the milk, water and chicken stock powder. Bring to boil while stirring with a whisk until a smooth sauce is obtained. Add the cheese and stir over moderate heat until the cheese has melted. Remove from heat and season to taste with Tabasco sauce, salt and black pepper. To make Mexican cheese and prawn soup, add 200g cooked peeled prawns, coarsely chopped, together with the cheese. Recipe by Carolié de Koster from the Art of Cooking Recipe Book p. 110. 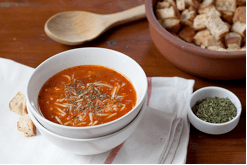 Though there are many versions of this soup, the traditional, tomato-based Spanish recipe is the one to go for. 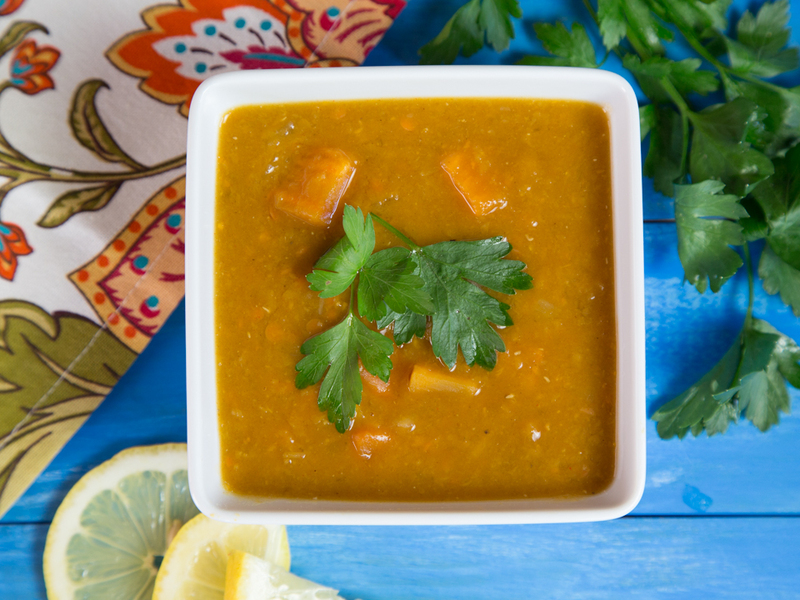 It is an uncooked soup and is very similar to a smoothie – it is like salad made in a blender. Combine all the ingredients in a food processor and process until you get the required consistency. Adjust the seasoning and refrigerate for 2 hours. Serve in individual glasses (150 ml each) with a dollop of creme fraiche and the diced vegetables or just a parsley leaf and a celery stick to stir. 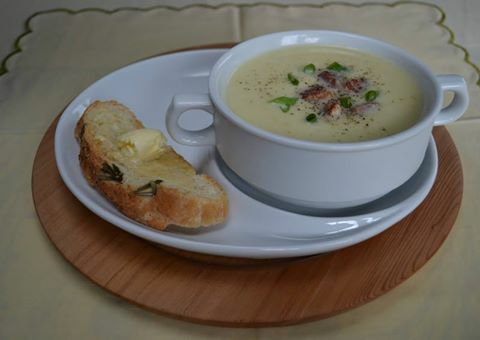 Alternatively, serve the soup in bowls with the garnishes on the side. 10 to 12 servings (depends on the size of the glasses you use). 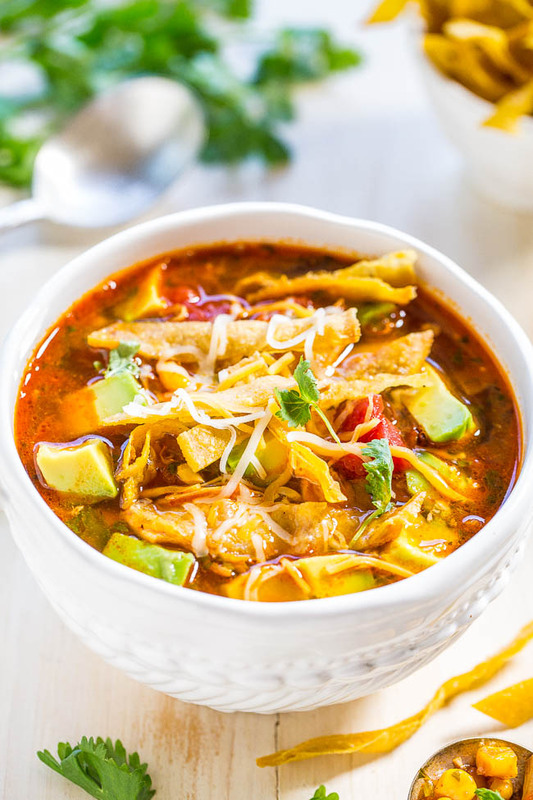 I could eat this soup every day of the week! It is quick and easy and it can be jazzed up to your liking. Place the bacon on the baking tray in a single layer and bake the bacon until cooked – about 10 minutes. Steam the baby marrows in a steaming basket or a steamer for about 10 minutes on a medium heat until the baby marrow is soft went pierced with a knife. Transfer the baby marrow to a large saucepan and add the peas, milk or cream, garlic and salt. Cook on a medium heat for a few minutes while stirring. Use a stick blender and process in the saucepan until pureed or transfer the mixture to a food processor and process to a puree. Transfer the cooked bacon to a chopping board and chop it finely. Add it to the saucepan or the food processor and process to a puree. Measure the milk or cream with a 250 ml measuring cup and add it to the saucepan. Adjust the consistency by adding prepared stock. Adjust the seasoning to your liking. Transfer to a serving and serve piping hot with fresh bread. 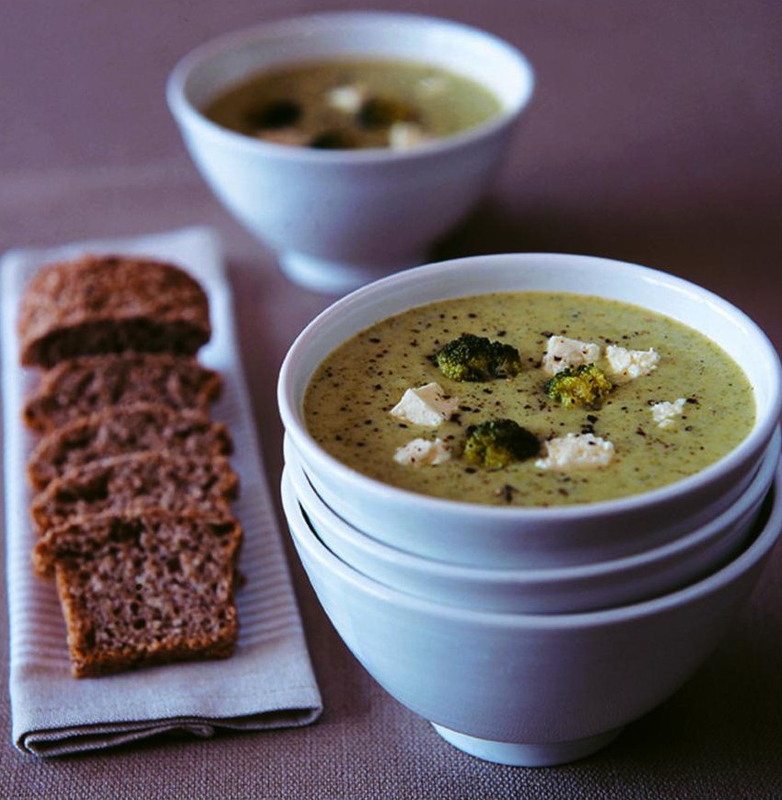 – Substitute the baby marrow with broccoli florets. Serve as a light soup with vermicelli noodles only or turn into a more substantial meal by adding the meat to the soup as well. If preferred the meat may be used as a separate dish. Serve with crusty bread and butter. Place the meat, water and bay leaves into a saucepan, bring to boil and simmer partly covered for at least one hour or until the meat is quite tender. Remove the meat from the saucepan, strain the stock and refrigerate or freeze the stock a while to solidify the fat for easy removal. Make up the stock to 1,5 litres. In the meantime, using a second large saucepan, saute the onion gently in butter until pale golden. Add the strained tomato, tomato paste, seasoning and water and bring to boil. Reduce the heat and simmer 10 minutes. Add the noodles and simmer until tender. Add the strained defatted stock, meat, spring onion and seasoning to taste and simmer 10 minutes more. Serve piping hot. A warm course to kick-start an otherwise room temperature and cold buffet. Serve piping hot with any bread or bread rolls as accompaniment. Heat the oil and sauté the onion, carrot and turnip for 5 minutes, stirring. Add the water and stock powder and bring to boil. Reduce heat and simmer 15 minutes. Add the contents of the tomato tins, sugar, garlic, basil, salt and black pepper to taste and simmer 5 minutes. Liquidise with a hand held blender until smooth or cool and liquidise in batches in a food processor. 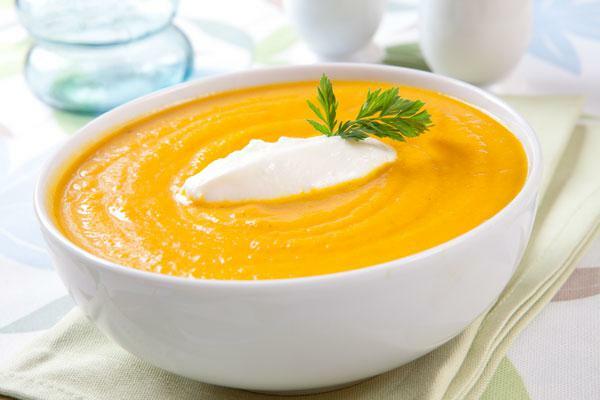 If an ultra smooth soup is preferred, strain the soup – the soup is also good as is with a slightly coarse texture. Mix the flour with the milk or cream in a large bowl and stir in about 250 ml of the soup. Add the mixture to the hot soup and bring to boil, stirring. Serve piping hot, garnished with basil. 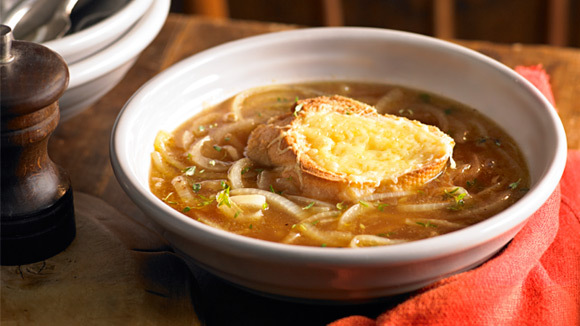 An elegant soup with a mild yet distinctive flavour. Place the butter or margarine, broccoli, onion and garlic into a saucepan and cook very gently over moderate heat for 10 minutes, stirring from time to time until the vegetables are soft but not at all browned. Stir in the flour, then the stock or water and stock powder and bring to boil. Simmer gently and partly covered for 20 minutes or until the broccoli is quite tender. Cool a few minutes. Pour the mixture into the bowl of a food processor and blend until completely smooth. Return to the saucepan and add the milk and nutmeg. Bring to boil and simmer 3 minutes more. Stir in the cream and sherry or wine and season lightly with salt, bearing in mind that the Feta cheese is salty. Add black pepper to taste and bring to boiling point just before serving. Dice the Feta cheese finely and add to the soup shortly before ladling it into soup bowls. Sprinkle with spring onion or parsley and serve with wholewheat or crusty bread and butter. 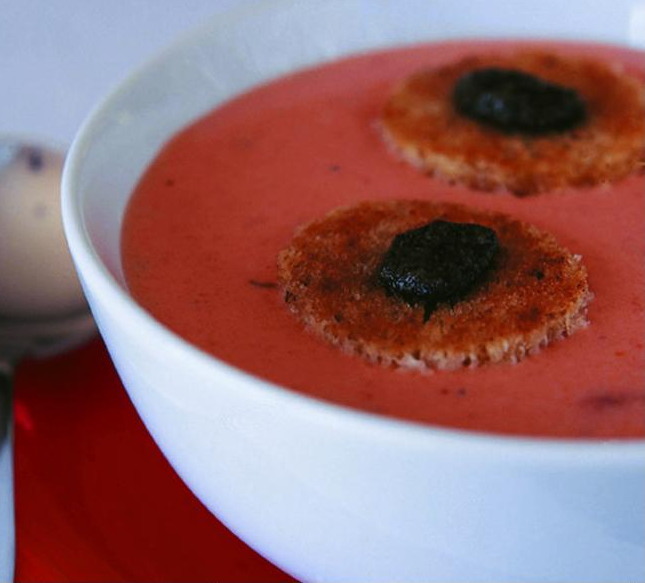 For a less rich soup, replace the cream with 250 ml milk mixed with 30 ml cornflour. Omit the Feta cheese and sprinkle the soup before serving with finely grated tasty cheese for instance Parmesan or Cheddar or white cheese for instance. 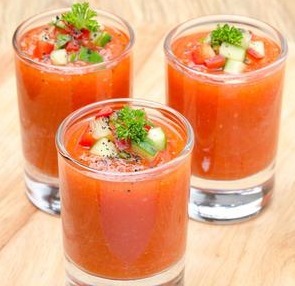 For a cold soup, cool and refrigerate the soup after step 4. Use only 100 g Feta cheese and dice it quite finely. 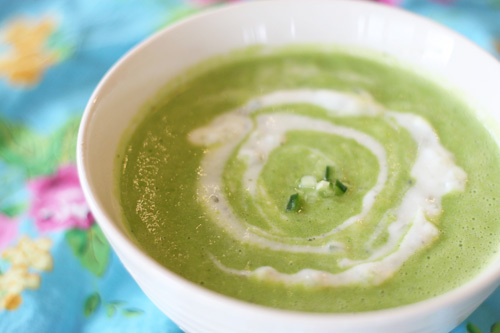 Spoon the cold soup into small ramekin dishes and sprinkle with the Feta cheese, spring onion and parsley. 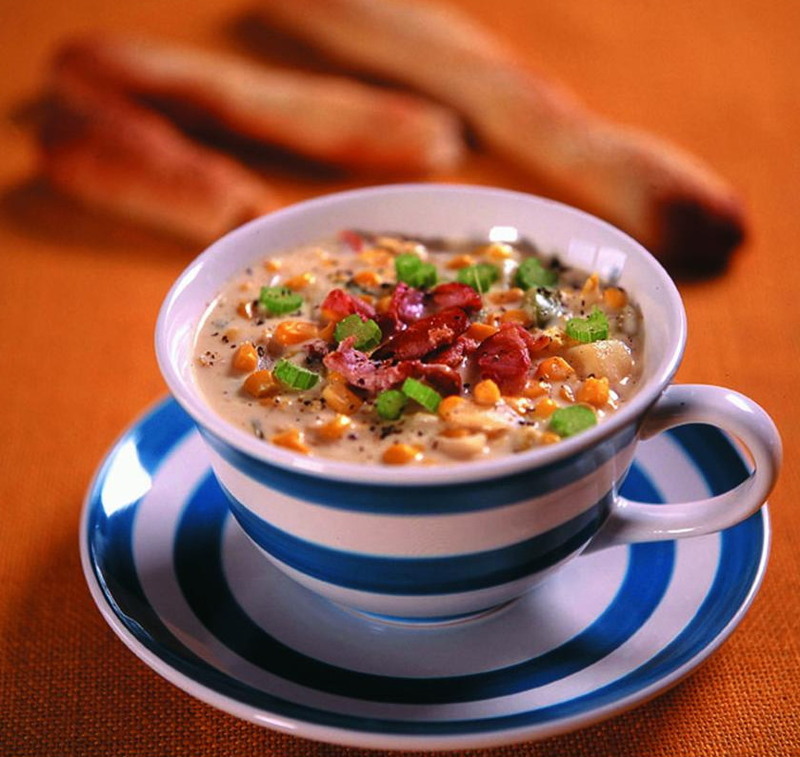 A soup of American origin which has gained immense popularity in homes and casual or formal dining out venues. Saute the bacon rashers in a large saucepan until crisp and cooked and remove. Cool, crumble and reserve. Add the onion, celery and green pepper to the saucepan with the bacon drippings and saute gently for 5 minutes. Add the potato, water, salt, paprika, cayenne pepper and bay leaf and bring to boil. Simmer gently for about 20 minutes or until the potatoes are tender to taste. Add the corn to the saucepan when the potatoes are tender. Combine the cake flour and 125 ml milk, stir into the soup and bring to boil while stirring. Stir in the remaining milk and/or cream, adjust seasoning and heat to boiling point. Serve piping hot, sprinkled with black pepper and parsley. For a vegetarian soup, omit the bacon and add a little more seasoning such as vegetable stock powder or a few drops Tabasco sauce if the soup lacks flavour. 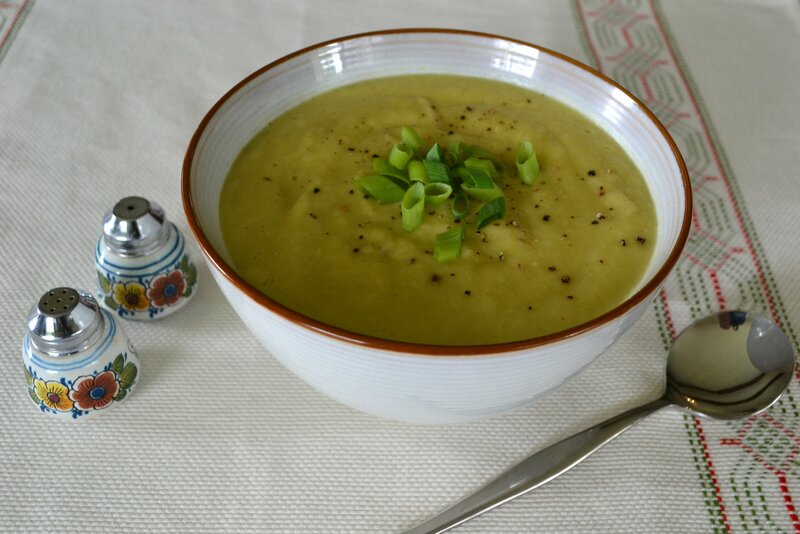 For a more colourful soup, use half finely diced red and half finely diced green pepper. Recipe by Carolié de Koster from the Art Of Cooking Recipe Book p. 108.